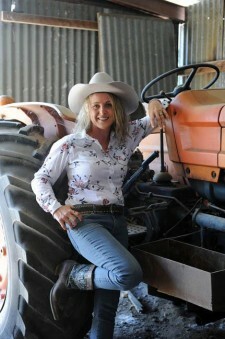 Today my guest is rural Penguin author Mandy Magro. 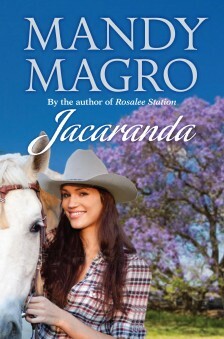 It’s seems fitting as just yesterday I recieved a signed copy of Jacaranda in the mail. 🙂 (It went to Karlgarin, another town up the road even though it was addressed for Pingaring but none the less I now have it in my hot little hand and will be reading it after I finish The Lavender Keeper) Jacaranda is OUT NOW! Congratulations, Mandy! So a huge thank you for my special signed copy and thanks so much for blogging with me today. Thanks for inviting me over to your blog, Fee. I’m so thrilled to be here! The time has finally come-Jacaranda has hit the shelves. This is the second time I have experienced the euphoria of releasing a book and it’s wonderful! I count my lucky stars each and every day that I’m a published author and I continually find the support from book shops, the media, other authors and of course the readers very humbling indeed. Very often I find I have to pinch myself to make sure I’m not dreaming. Today I would like to explain where I get the inspiration for my writing. It comes in many forms but the most influential is the land I am so very blessed to live in. The country is so enchanting in so many different ways…. The world comes to life for yet another day as the sun rises magnificently from behind the lush mountain tops, sending the sky gorgeous hues of pink, orange and red. The wide open spaces sprawl out before me, the sunlight dancing across the ground as if in celebration. The bellow of a bull travels along with the gentle morning breeze. A flock of red tailed black cockatoos fly noisily overhead and as I gaze up in awe of them a wedge tail eagle catches my attention as it circles effortlessly in the expanse of the brilliant blue sky. I take a sip from my tea, smiling as a kangaroo goes bounding through my backyard with its Joey in toe, vanishing behind the glorious golden wattles trees that line the back fence. Hank, my bantam cross rooster crows his good morning to the world, announcing his dominance over the hens (I sometimes wonder whether he has small man syndrome seeing he’s that loud!) In the distance I can hear my hubby out in the tractor, tending to our upcoming harvest of tropical fruits. I love this time of the day; it leaves me breathless with wonderment at just how lucky I am to be living in such a unique and peaceful landscape. After a breakfast which normally consists of fresh eggs from my chickens I head off into theDimbulahTownshipwith my little girl, Chloe, to check the post box (there is no post man out here in the sticks! ), run some errands and have a good old catch up with mates that are in there doing the same thing. Some of them I haven’t seen for weeks and they are my neighbours! Mind you, they do live quite a few kilometres down the road. Then it’s back home to write, read or tend to the garden. The day floats by as I do the daily tasks of being a mum, cooking, cleaning and farm jobs. If we are eating beef for dinner it is always from our own supply of cattle and I always try to include something from our very own veggie patch. In the late afternoon, when it has cooled down, it’s out to the backyard to play with the dogs and watch as the sun begins to set on the horizon. The horses swish their tails as they ward off the flies, their heads down as they languidly chew on grass. Once again I cannot help but gaze at the vastness which is my backyard. It’s an amazing place to be living and I feel so very blessed to be here. As the sun slips away and night time wraps its cloak of darkness around us the sky becomes a dazzling show as millions of stars take their rightful place in the country sky. I take a satisfied deep breath, letting it escape slowly; the outback is a truly beautiful place, it is my home, my obsession and my inspiration to write. At nineteen, Molly Jones has the world at her feet. Then one drunken night she falls into bed with Mark, a cowboy just passing through. By the time Molly realises she is pregnant, Mark is long gone. From the author of Rosalee Station, this lively and passionate love story bursts with the colour and feel of Tropical North Queensland. It’s been great chatting with you Fee.